The announcement just over a week ago that Marks & Spencer is to leave Kirkcaldy is another blow to an already struggling town centre. Hikes in parking charges, high business rates, free parking at the retail park and changes in consumer purchasing trends, have all hit the high street. Hearing Marks & Spencer though is to leave comes as a bigger concern as it being there is undoubtedly what draw footfall to the town centre and in turn leads to business at other, often smaller, retail outlets. At next week's Kirkcaldy Area Committee a motion has been tabled by Cllr Richard Watt and I calling for a full and frank discussion. There is already much talk being generated by councillors and local people - the views are wide and varied. Whilst I have some initial thoughts on what has gone wrong and what can be done about it, I very much believe in hearing the voices of local people - therefore, prior to next week's meeting I am looking for thoughts and feedback from people on what they think. • Esplanade redevelopment is suspended until a credible business plan showing third party buy-in and tangible economic benefit to Kirkcaldy is produced. • A report detailing feasibility and associated cost of removing all parking charges from car parks serving the town centre is brought to the next committee. • A report detailing possible concessions of town-centre non-domestic rates is brought to the next committee. • A series of TROs detailing the de-pedestrianisation of the High Street are brought for approval to the next Kirkcaldy Area committee. 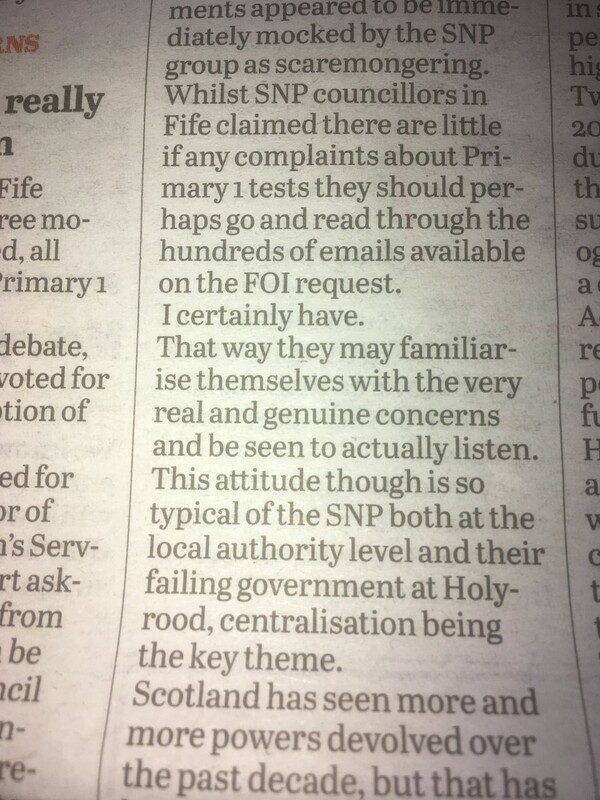 Following on from Fife Council voting to halt Primary 1 assessment I was asked to provide a comment to The Courier. An SNP MP claimed councillors voting to halt these tests was "political vandalism". Below is the text of the press comment and a link to the article. A letter to the media is also attached here. 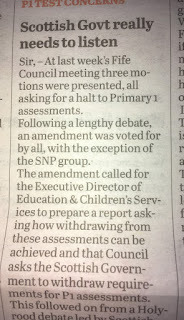 At last week’s Council meeting three motions were presented, all asking for a halt to Primary 1 Assessments. Following a lengthy debate, an amendment was voted for by all, with the exception of the SNP group. 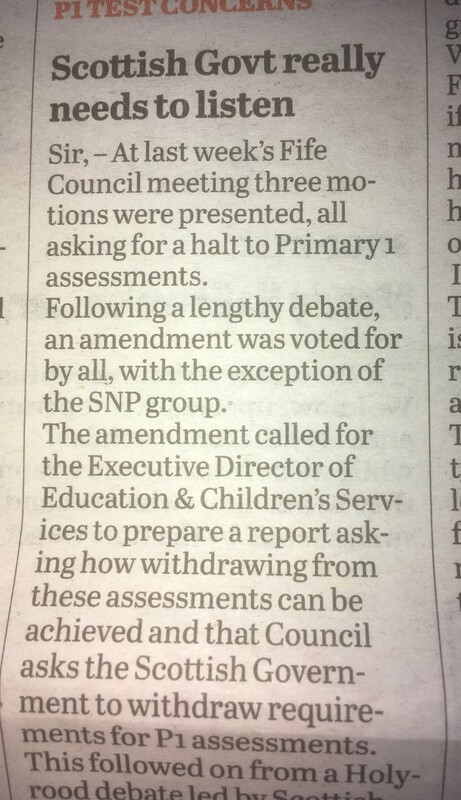 The amendment called for the Executive Director of Education & Children’s Services to prepare a report asking how withdrawing from these assessments can be achieved and that Council asks the Scottish Government to withdraw requirements for P1 assessments. 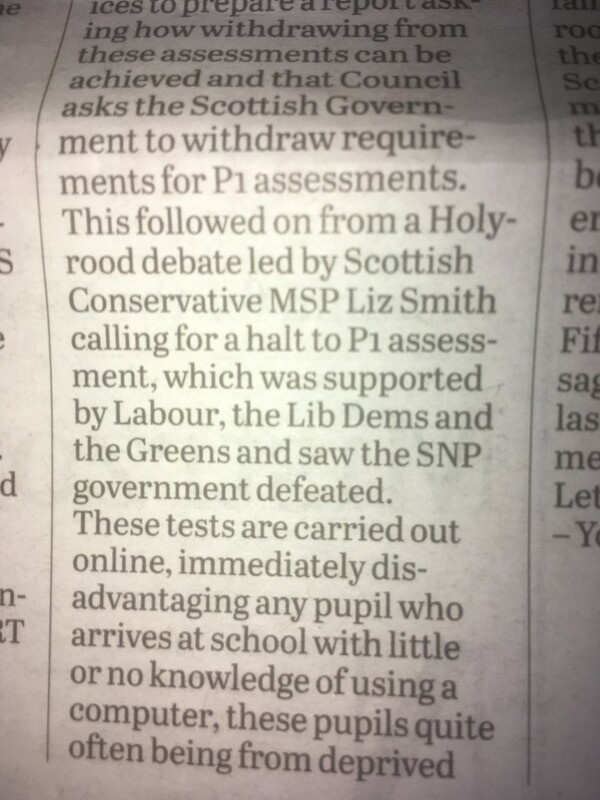 This followed on from a Holyrood debate led by Scottish Conservative MSP Liz Smith, calling for a halt to P1 assessment, which was supported by Labour, the Lib Dems and the Greens and saw the SNP government defeated. 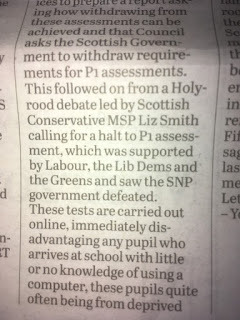 These tests are carried out online, immediately disadvantaging any pupil who arrives at school with little or no knowledge of using a computer, these pupils quite often being from deprived backgrounds. The tests eat into teaching time and have resulted in some schools having to buy in supply staff. More worryingly though, children have been left distressed, crying and feeling demotivated. How do we know this? 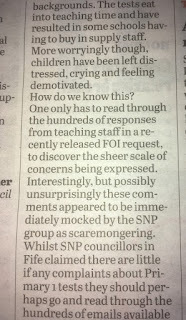 One only has to read through the hundreds of responses from teaching staff in a recently released FOI request, to discover the sheer scale of concerns being expressed. Interestingly, but possibly unsurprisingly these comments appeared to be immediately mocked by the SNP group as scaremongering. 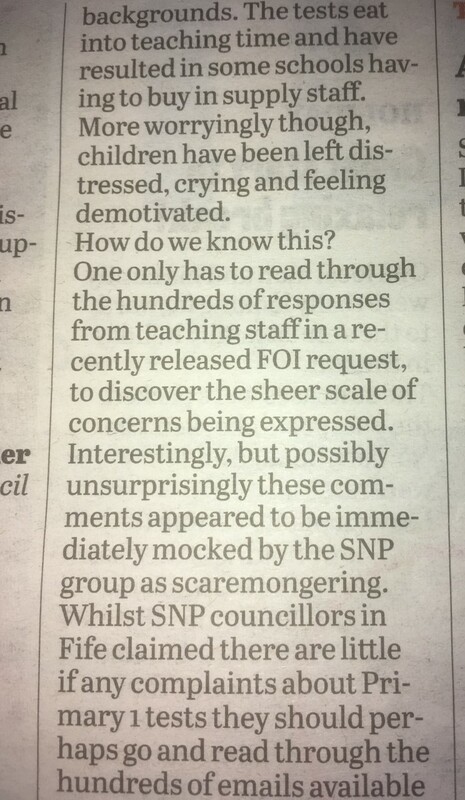 Whilst SNP councillors in Fife claimed there are little if any complaints about Primary 1 tests they should perhaps go and read through the hundreds of emails available on the FOI request, I certainly have. That way they may familiarise themselves with the very real and genuine concerns and be seen to actually listen. 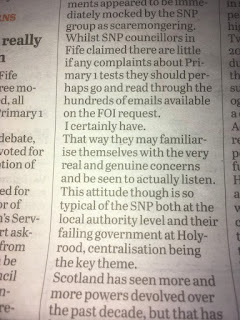 This attitude though is so typical of the SNP both at the local authority level and their failing government at Holyrood. Centralisation being the key theme. 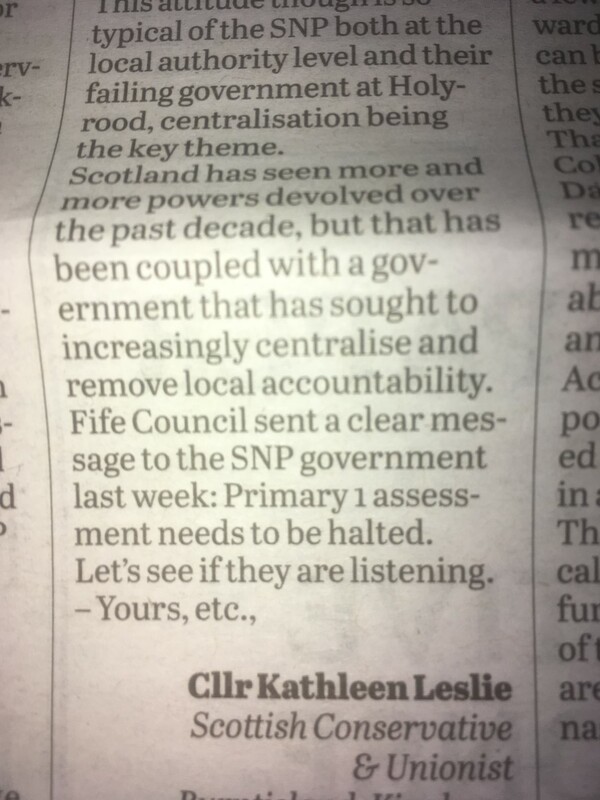 Scotland has seen more and more powers devolved over the past decade but that has been coupled with a government that has sought to increasingly centralise and remove local accountability. 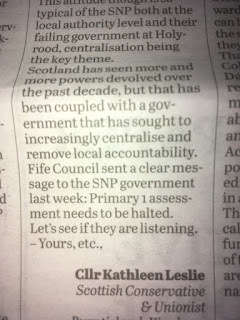 Fife Council sent a clear message to the SNP government last week; Primary 1 assessment needs to be halted. Lets see if they are listening.